The Dallas Mavericks have never made a lick of sense as a potential contender, not when they were a Erick Dampier-led powerhouse, not when they actually somehow won a championship, and not these past few years when they’ve been flirting between supremely competent upper-echelon mediocrity and the banality of evil. A “witty” way to describe different paths taken would be to say some teams zig while other teams zag, but the Mavericks neither zig nor zag. Instead the line of their recent past traces a smooth curve orbiting about the beating heart of an aging German genius. As long as Dirk Nowitzki lives, the Mavericks’ plan appears to be bidding against themselves for other past their prime players with famous names—Kidd, Carter, Marion, Jefferson, Stoudemire, and most recently and disastrously Rondo—and hoping for the best. Never has this borderline tragic water-treading squad, with that one beautiful 2011 exception, been more excruciating to watch crumble than it was this year. The team began the season as an offensive juggernaut, then slid into sleepwalking mediocrity, a sort of melancholic dream state through which recognizable faces periodically floated, looking sad. Which is why it struck us as strange that no one has yet made the obvious connection between the 2014-15 Dallas Mavericks and the ladies of Frederico Fellinni’s La Dolce Vita. After a helicopter carting around a big statue of Jesus and a weird upscale dining Orientalist halftime show, we meet Marcello. Marcello’s mission in the world is to spin lurid tales about the lives of Italian celebrities for money; he is also the axis around which a constellation of beautiful women orbit. This axis, for Dallas, is indisputably Dirk Nowitzki, our eyes and ears, our big-boned naif of a hero. When he leans against a nightclub bar, who is there to greet him but Maddelena: the heiress whose desires for a long-term relationship are overwhelmed by her need for flighty trysts. Monta Ellis, in a similar fashion, represents something fun and beautiful for the Mavs and for Dirk, but ultimately illusory. Like Monta, Maddelena adds a curious, incalculable dimension of toughness to the proceedings; she has the weariness of a life trajectory that didn’t go exactly as planned, but here she is, still standing in defiance of it all. When she says to Marcello, “Only love gives me strength,” there is an echo of Monta’s frustration with the process of having his story yanked from beneath him. It’s there in his unease in front of cameras, and his incredulousness that, for all his brilliant work, he’ll forever be known as the guy that said “Monta have it all” instead of for all the love he was willing to give. He’s there for the wild times of cruising around Rome in expensive cars, there for the wilder times in the basements of strangers, but we still half expect him to break our hearts. Which is fine, because Dirk/Marcello returns home to an overdosing Emma, whose passions have driven her to self-destruction. She’s beautiful and loyal but also somewhat bonkers. Emma is someone who will do things her own Kobe Bryanting way, coach be damned. There might have been the potential for harmony in this relationship, but it’s poisoned, and we’re so far past the point of no return that all the thousands of relationship advice listicles ring hollow. Perhaps it was inevitable. This is Emma, and this is Rajon Rondo. And perhaps we’ve been too unfair on Rondo (and Emma) this entire time, begging him to bend to our will, instead of trying to meet him halfway. Rondo outgrew his clothes and his place in history before our very eyes, so now we’re unceremoniously dropping him off to detox and going out for a night of dancing with the thrilling American bombshell Chandler Parsons, the Sylvia of Cubanland. Parsons and Sylvia both arrived with major fanfare and they are both immediately objectified and lusted after, for they represent a dollop of excitement in otherwise predictable milieus. He’s beautiful—rockin’ abs Chandler!—and adventurous, but every time you’re about to tell him you love him, he runs off or gets bogged down by a disastrously awkward shooting slump. Dawn breaks and you realize you’re standing with Parsons in the middle of the Trevi Fountain. How did you get there? A street-sweeper smirks at your soggy tuxedo as you lead Parsons to your car. At some point, drunkenly stumbling to a new party at a creepy old mansion, you meet the Mavs’ analogue to Fellini’s Nico: Amar’e Stoudemire. The pair are two haunted bohemians who peaked too soon. She speaks Italian with a German accent, which fits wonderfully amidst the tangled webs of Amar’e’s identity. As the party goes on, Nico finds an antique knight’s helmet, proceeds to wear it for the rest of the night. There can’t be a more on-the-nose metaphor for Amar’e Stoudemire than a woman putting on a knight’s helmet at a creepy old mansion. It’s hard to parse, but it just feels right. 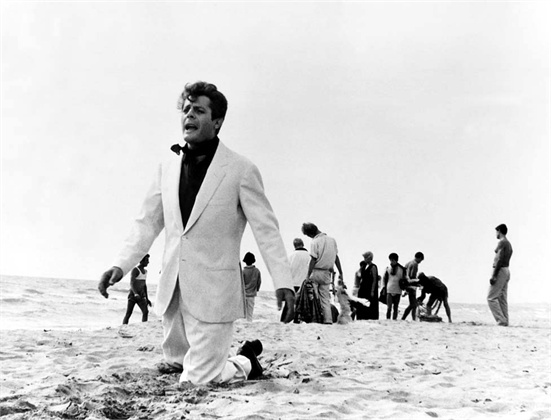 Everyone in La Dolce Vita has a smattering of insanity on them, but Nico here embodies Amar’e particular brand, which is of course an amalgamation of manic pixie dream girl and a minor character in a Greek tragedy. Fortune cookie-sized slips of paper with a madman’s instructions on it, drawn at random from a pouch sewn of kangaroo ears: this is where Amar’e finds his life advice. Take a break from all of this craziness, Dirk-cello. Sit at your typewriter in the Italian sunshine. See the warm smile of a young Paola, who is in our extended metaphor Tyson Chandler—a man who cares about what’s happening with the ivory trade right now, who might have a pet squirrel. This man is here to remind you what simple, innocent beauty looks like. Tyson Chandler, the gentle giant who more than anyone else helped Dirk finally achieve his dream of joining immortals like Robert Horry, Tayshaun Prince, and Sasha Vujacic as a NBA champion. Chandler is sort of a lighthouse drifting away in the fog, screaming at you to pull out of the monstrosity your life and team have become, but by the time his signal reaches you, it will be too late. It didn’t have to be like this, but it is. Your former life together, with the cool championship rings and the games of hot potato with the Larry O’Brien Trophy—that world is now lost at sea. Finally, the grim conclusion: a gentleman’s sweep by the loathsome Houston Rockets and the saga of Nadia, the recent divorcee trying a bit too hard to get back out there. Poor Nadia is clearly our old “friend” Raymond Felton. Felton has ever been a bit too eager to prove to the Bobcats, Knicks, Nuggets, Trailblazers, and the Knicks again that they were wrong about him the entire time, that he was underappreciated or ill-used or the timing was off, that he could have been good for them! He will dance just for their attention. All he wants is someone to tell him he is beautiful, just those few words being enough to pull him back from the brink. Spoiler: none of these relationships work out for Marcello, nor unfortunately did they work out for Dirk this calendar year. A tale of attractive young people gilded in movieland glitz devolves into a horror story, a dejected Nowitzki throwing feathers and gin-fizz on what few partygoers remain. There’s always the next season, the next party, but Dirk grows old. The Mavericks were a beautiful experiment of cautious recklessness and former star-power. They flirted with destiny and won more games than they lost, but La Dolce Vita isn’t 8 ½ and the Mavericks aren’t the Spurs.The Mavericks have a different sort of beauty, like watching a beautiful sunset with funhouse mirror aviators. Some day Dirk and Marcello and their lovely friends and foils will fade away, their words and deeds lost in the wind. But we’ll remember. Sort of. BONUS NOTE: Charlie Villanueva is our primordial sea creature, unearthed mostly to jerk the viewer out of the world of the cafés and parties.